The Caspian Sea is the largest lake, both by its area and volume. The watershed of this large water body is approximately 3.5 sq.km that makes more than 10% of all drainless areas on the earth. The Caspian has a lot of unusual features. Its level is lower than the mean sea level (M.S.L.). In the 20th century it has been fluctuating within the range of almost four meters, approximately from -25 m in the beginning of the century to -29 m in 1977. In the end of the 20th century, the sea levels unexpectedly soared, and in the beginning of the 21st century began to drop again. The Caspian is not a freshwater lake. Its waters are rather brackish; three times less concentrated than in the World Ocean. As well as all land-locked lakes, the water balance of the Caspian hinges on precipitation, river and ground water runoffs, and evaporation, which are directly linked to atmospheric circulation. The Caspian Sea has also unusual origins. It is a remnant of the ancient northern gulf of the Thetis Ocean, which used to connect the Atlantic and the Pacific Oceans. The Caspian can be compared to Australia because it was separated from the World Ocean a long ago, as Australia was from other continents. Many rare animals and plants, which are called living fossils, have survived both in the Caspian and Australia due to the isolation. The Caspian is not a homogeneous lake. Three different water bodies are united within its borders, each of them has its own physical conditions and biological diversity. Of these, the first water body is its northern area. The second is its middle and southern areas. The third is the shallow gulf Kara-Bogaz-Gol, located at eastern coast of the Caspian. Of these three water bodies, the second one is the largest. It contains some 99% of the total volume of the sea and occupies two thirds of its surface. Many researchers consider this part of the Caspian Sea as the real Caspian. The water salinity is almost stable here fluctuating within 12-13 gr/l. This is the normal salinity of the Caspian. 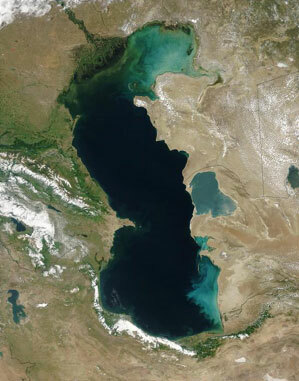 This part of the sea is inhabited by the greatest number of unique Caspian species, which descend from ancient inhabitants of the Thetis. This is the deepest part of the sea, which in the southern basin exceeds 1 km. This part of the Caspian has never completely dried up, independently of climate changes that occurred in past geological epochs. A sufficient amount of water has always remained here, consequently preserving the life in it, though the increased water salinity usually resulted in reduction of the number of inhabitants in such regressive phases. The area and volume of the northern water body is smaller. It contains about 1% of the volume of the Caspian, and its area amounts to one third of the total area of the Caspian. Its water salinity is not stable and, as a rule, is lower than that of the Middle Caspian by a factor of 2 or 3 due to river runoffs. Namely, the Volga meets the Caspian Sea here, and this river provides about 80% of the total river runoff. Many unique Caspian species rarely occur in this part of the Caspian because of low water salinity, however some of them run to this area to spawn. Many freshwater organisms range only here and never occur in the Middle and Southern Caspian, where the water salinity is too high for them. This part of the Caspian is shallow and maximal depths never surpass 10 m. Due to shallowness, this area repeatedly dried up in past geological epochs, and its inhabitants either perished, or lived in deltas and estuarine reservoirs of Caspian rivers through unfavorable periods. The gulf Kara-Bogaz-Gol is the smallest by its area and volume. Allegedly, it is the third water body within the Caspian. Though its area makes only 3% of the area of the whole Caspian, and its volume is significantly small, this reservoir deserves special attention. Its surface is below the level of the Caspian by several meters and a lot of water constantly drains into it. This water quickly evaporates at shoals of the gulf and the water salinity is extremely high there: ten and even twenty times the water salinity of the Middle Caspian. Inhabitants of the Caspian Sea don"t live here because of the high salinity. The gulf is inhabited only by salt-loving organisms. This area repeatedly changed its outlines during climate changes of past geological epochs. The gulf used to become either very vast, or completely dried.